(4) Gornoaltaisk University; Zoological Museum of Moscow State University. Please note: from 18 May 2019 this website is only available at www.jvanderw.nl/tomskbirds. Googling on 'birds tomsk' will lead you now already to this address so that may be the easiest way to come back. For a list of species in Russian, click here (Acrobat needed; in seasonal sequence). However, on each species page the Russian name is also given. "The power and the magic of the taiga are based on the fact that only birds of passage know where it ends." In the centre of Eurasia, around the west-Siberian city of Tomsk, many bird species occur which are rare in Europe, along with many others which are more familiar. Tomsk, a city with one of the oldest universities in Russia, is located in the southern taiga belt at around 56°N 85°E. It is situated on the somewhat elevated southeast edge of the vast west-Siberian lowlands behind the Urals. See location of Tomsk province on the wikipedia map below. - a colour bird illustration (new on this website version). The names of the bird species are given in scientific, English, Russian and Dutch. 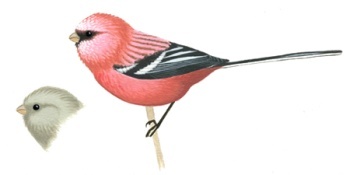 Long-tailed Rosefinch is the emblem of the Zoological Museum of Tomsk State University. Colour illustration by David Khaidarov. Nearly half of the species presented here are rare or uncommon in most parts of Europe, at least as breeding birds. It is interesting to learn more about the songs and habitats of these rarer birds in their breeding area. For the more familiar species (often a different subspecies) it is interesting to compare the song and habitat with their counterparts in western Europe, around 5000 km further to the west. Of course one can also just enjoy the sounds and pictures. The species index on the left is in systematic order. Alternatively one can also go through the seasons (click at 'start here' above left; this is the date sequence of the recordings). The sound recordings and photographs of this website/cd-rom were made in the area by Sergey Gashkov of the Zoological Museum of Tomsk State University. Sergey had technical assistance from Evgeny Karachakov. Sergey's material (a cd with photos, sounds and Russian text) was incidentally brought from Tomsk by Inez Brandsma. John van der Woude and Inez conceived the plan to publish a cd-rom in English (set up in html web language already) and distribute it in Europe. 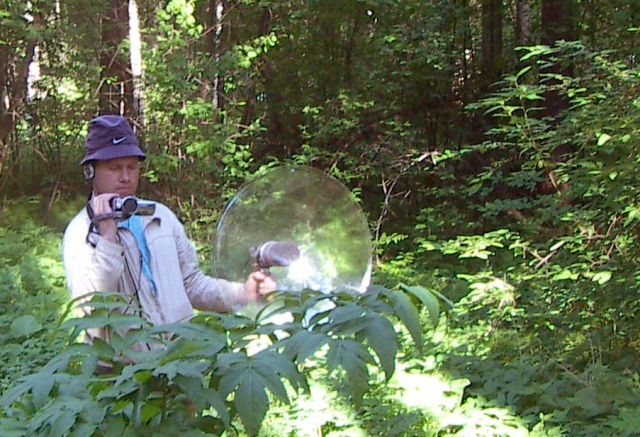 Of this cd-rom (2006), over 120 were eventually taken by birders from allover Europe. The preparation of the website/cd-rom was as follows. Sergey's Russian text was translated by Inez Brandsma, and she also took care of all contacts with Sergey. The website/cd-rom was designed and produced by John van der Woude. John also helped with the translation into English. For the present website version, Maria M. Samsonova of Tomsk State University partly improved the English text based on the Russian text and her knowledge of the matter. The bird illustrations by David Khaidarov were also made at the Zoological Museum of Tomsk State University. © Copyright of this website and all its content except the bird illustrations: Sergey Gashkov. Contact him at email: parusmajorl at gmail.com, or in English or Dutch via: i.e.brandsma at planet.nl. Use @ for ' at '. 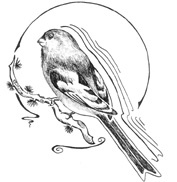 © Copyright of the bird illustrations: David Khaidarov. Contact him at davidson_avis at yahoo.com. For general questions about this website, email John van der Woude: johnbirding at gmail.com.